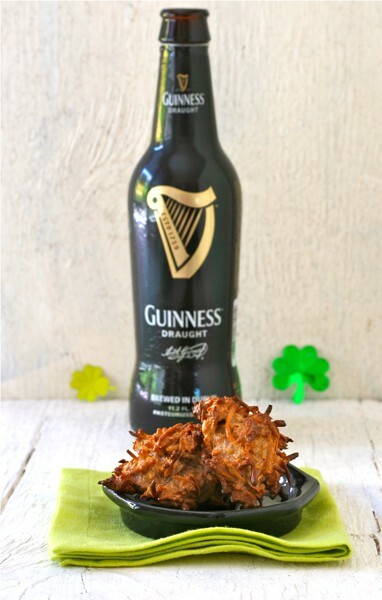 This year for my St. Patrick’s Day post, I knew I wanted to make something sweet that included my favorite Irish beer, Guinness stout. I had thought about brownies, or possibly a cake, but when I saw this recipe for macaroons with Guinness and a little chocolate, I had my recipe. You can find the original recipe in the current issue of Fine Cooking, one of my favorite magazines. TIP: My macaroons baked faster than the suggested 25 minutes. Watch yours carefully. An easy macaroon recipe that includes Guinness stout and a bit of dark chocolate. Position oven racks to top and bottom thirds of oven. Preheat oven to 350 degrees. Line two rimmed baking sheets with parchment paper. Pour the Guinness into a saucepan and boil until syrupy and reduced to 3-4 tablespoons, about 15 minutes. Set aside. Combine the condensed milk and vanilla in a large bowl. Stir in the Guinness reduction and melted chocolate. Add the coconut and mix thoroughly. Beat the egg whites and salt with an electric mixer on high speed until stiff peaks form, about 3-4 minutes. Use a plastic spatula to fold the egg whites into the batter, then push the batter into a mound. Using wet hands or two wet spoons, gently form rounded tablespoon-sized balls and place on parchment paper about 1½ inches apart. Bake about 10 minutes, then switch sheets to other rack and also rotate them. Bake another 10 minutes and check for doneness. The cookies are done when they are golden brown on top and tan on the bottom. Allow to cool briefly in the sheets, then cool completely on racks. I appreciate your gentle reminder that I had forgotten to include the coconut in my ingredients – thanks, Greg, so much. Woa. Now that’s my kind of macaroon. The Guinness syrup and a little chocolate just gives the cookies a rich taste, nothing specific. I’m with Greg – definitely a party hearty cookie! Oh yes! I am so going to try this!!! We love Guinness here as well 🙂 Lovely pic! Try and see if it works for you, Wendy – I am such a bumbling baker. Mine were over done, though not by my fault. The photos reflect a one tablespoon measure for each cookie – no way! Now this is what I call luck of the Irish! And I guess we are all Irish on St. Patrick’s Day, Steve, right? How festive, love the picture! Happy St Patrick’s day! Thanks, dear Jayne – counting the weeks until our NH visit! PERFECT for St. Pat’s. And since I love a good stout beer too, I can eat these all year round.